Actually, Chulu Peaks consists of two different peaks- Chulu East and Chulu West. 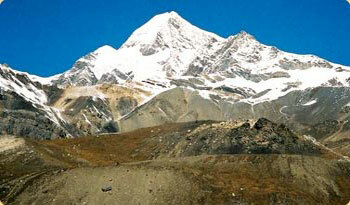 Chulu East (6059m) with its amazing views of Annapurna Himalayas enthralls you. Chulu East mounts from the North part of the Marsyangdi River positioned in the Manang area plus from splitting up the Manang Himal integrated in the larger Damodar Himal. The path of Chulu East will takes us up passing the Marsyangdi River which is rapidly flowing and holds no huge altitude. Trekkers should have knowledge of using equipment like ice axe, crampons, tying knots, manage mountaineering ropes etc. Besides, trekkers are required to be fit as well as have experience of climbing. The walk will go by unexpected range of scenery and let you view unique way of life; traverse rhododendron plus pine forests; the terraced lands, Gurung community and the warm character of Manange citizens. We will follow the trail of the traditional Annapurna Circuit, we continue to place our high camp to the south-west edging of Chulu East and after that we go up from side to side with easy snow-slopes. Furthermore, we will walk downward to Manang in the endless crevice of the Marsyangdi Valley, and followed by reaching Jomsom passing by the eye-catching Tilicho Lake. Chulu East will allow any trekkers to observe the awe-inspiring sights of the Annapurna Himalayan range II, III, IV, Gangapurna, Glacier Dome, Tilicho Peak, Manaslu, Dhaulagiri etc. This far-off high land section sited to the North direction and in the shades of rain is formed by the Annapurna range. Boundless Himalaya Trekking and Expeditions will arrange you to visit Chulu East trek through not often walked track and bestow a memorable trekking holidays. Passing through the Marsyangdi valley with the views of Manaslu, Annapurna II, III, IV, Gangapurna, and Tilicho peak, exploring Pisang and Gyaru, Ngwal village and primitive monastery etc.